We have something new and amazing here at ToySplash and we want to tell you all about it! Mosquito's are a pain and nothing ruins a summer night more than a mosquito bite itch or worse, infection. So lets put an end to those pesky insects, at least in your own backyard! 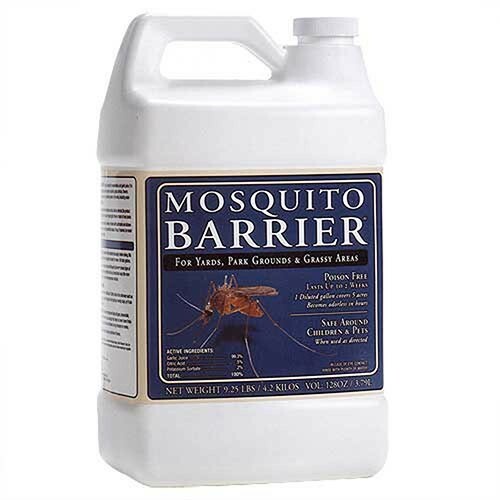 This product is called Mosquito Barrier and it has been around for 26 years so it is highly tested. They use an ingredient that we consume all the time therefore it is entirely safe to be around...GARLIC. Scientists have a few reasons as to why these soft body insects avoid it at all costs. 1) Powerful components such as the enzyme allice are harmful to mosquitos 2) The strong odor simply repels them 3) The natural sulfur in garlic repels them. Whatever the reason, it is scientifically proven that mosquitos DO NOT LIKE GARLIC. You can read more about this on the Mosquito Barrier website! The garlic used in Mosquito Barrier is even more potent than that sold in your local grocery store. Mosquito's can detect it 10,000X better than a human and thankfully, you will not even smell it! Make a cocktail: Not one you can drink! But one that helps with mosquito problems even more. If you mix canola oil, water and Mosquito Barrier, you can form a very thin, natural film on top of standing water to suffocate any mosquito larvae and it will not harm other insects that we greatly need such as bees. ONCE AGAIN, THIS PRODUCT IS COMPLETELY SAFE AROUND YOU, YOUR CHILDREN AND YOUR PETS! We sell both the gallon size and quart size of Mosquito Barrier. The quart covers 1.25 acres and the gallon covers 5 acres! So enjoy those summer nights outside with friends and family and don't think twice about mosquito bites or the safety of sprays that repel them!